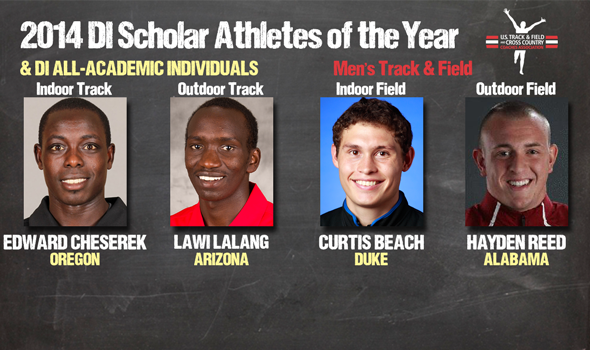 NEW ORLEANS – Edward Cheserek of Oregon, Lawi Lalang of Arizona, Curtis Beach of Duke and Hayden Reed of Alabama have been named the men’s Scholar Athletes of the Year in Division I for the 2013-14 track & field season by the U.S. Track & Field and Cross Country Coaches Association (USTFCCCA), the association announced Tuesday. Combining their accomplishments in the classroom and in competition during the recently completed academic year, those four men stood out among a group of 496 men who earned USTFCCCA All-Academic honors. The full breakdown of All-Academic selections can be found below. Scholar Athlete of the Year Awards are determined from among those who earned All-Academic status and placed highest in individual events at the NCAA Championships. Those who earn multiple individual championship titles rank higher in the tie-breaking process, and cumulative GPA is weighed as the final tiebreaker to establish a winner. Separate awards are given to track athletes and field athletes for the indoor and outdoor seasons, resulting in four categories. Cheserek, a freshman business major with a 3.33 cumulative GPA, is the first men’s Scholar Athlete of the Year from Oregon since Galen Rupp swept the indoor and outdoor awards in 2009. In just his first collegiate season, Cheserek won both the 3000 and 5000 meters titles at the NCAA Indoor Championships, boosting him into contention for The Bowerman Trophy – which Rupp won in 2009 – as one of three Finalists. Lalang, a senior public health major with a 3.40 cumulative GPA, earned the outdoor track award for the second consecutive year after sweeping both seasons’ honors a year ago. The Eldoret, Kenya, native claimed the 5000 meters national title outdoors in a meet record and finished runner-up at 1500 meters. He is also a Finalist for The Bowerman for a second consecutive year. Beach, a senior psychology major with a 3.45 cumulative GPA, is the recipient of the indoor field award for the second time dating back to 2012. In 2014, the native of Albuquerque, N.M. won the NCAA Indoor Championships heptathlon title in his hometown. Reed, a freshman biology major with a 3.52 cumulative GPA, claimed the outdoor field award after winning the discus title at the NCAA Outdoor Championships. The Orange, Texas, native is the first man from Alabama to have earned the award since it began in 2007. Including the Scholar Athletes of the Year, a total of 496 men from 165 institutions earned USTFCCCA All-Academic honors for their combined academic and athletic accomplishments. Nebraska led all teams with 16 honorees, dethroning the two-year reign of BYU as the best represented squad. The Cougars were next with 15 All-Academic selections. New Mexico and Akron also reached double-digits with 13 and 10, respectively. Headlined by Nebraska, the Big Ten topped the list of conferences with 52 honorees, followed by the SEC with 39 and the Big East with 36. Seventeen different men recorded a cumulative GPA of 4.0. The full list of All-Academic selections is provided below, arranged alphabetically by team name. Houston Summers North Carolina 3.81 Psychology B.A.